An Ohio State Highway Patrol trooper removes a ground spike in front of the fire ball ride at the Ohio State Fair in Columbus. The Dutch manufacturer of a thrill ride that broke apart and killed an 18-year-old man at the Ohio State Fair says excessive corrosion on a support beam led to a “catastrophic failure.” A statement on KMG’s website dated Friday, Aug. 4, says the company officials visited the accident site and conducted metallurgical tests. A manufacturer’s explanation that corrosion caused an amusement ride to fly apart in a deadly accident at the Ohio State Fair doesn’t answer why or when it began rusting away or how it went unnoticed. The details released by the ride’s Dutch manufacturer, KMG, do give some clues about how one of the ride’s carriages with four people broke apart, killing a high school student and injuring seven other people. KMG says excessive corrosion within a support beam wore away the steel wall’s thickness over the years, causing the catastrophic failure of the swinging and spinning Fire Ball ride. The company said Sunday it was developing new inspection guidelines. Corrosion experts say the company’s account points to water or wet debris being trapped within the hollow support arm, likely while it was being transported or stored during the winter. “You don’t want puddles in any ordinary steel, whether it’s a car, a gutter on a house or a playground,” said Oliver Moghissi, a former president of NACE International, a trade association that calls itself the world’s authority on corrosion. “If it sits for a long time, you can get higher corrosion rates,” he said. What’s not clear is how the water got inside the beam. Outside structures should be designed in a way that moisture can’t be trapped, Moghissi said. “Somewhere inside that there had to be moisture,” said Ron Knight, a chemist who owns Corrosion Pro in Palmetto, Florida. His company has worked with amusement companies on preventing corrosion. “You can never stop it, but you can certainly try to slow it down,” Knight said. Ultrasonic testing is the best way to find if corrosion is eating away at metal, he said, but sometimes it can be felt or spotted when rust builds up. The ride’s operator, Amusements of America, submitted paperwork to the Ohio State Fair showing it completed ultrasonic testing of the ride’s 24 gondola arm pins last October. But it’s not clear whether the tests examined the area where the carriage broke on July 26. Those tests are done based on the manufacturer’s recommendations of where to look for potential problems. 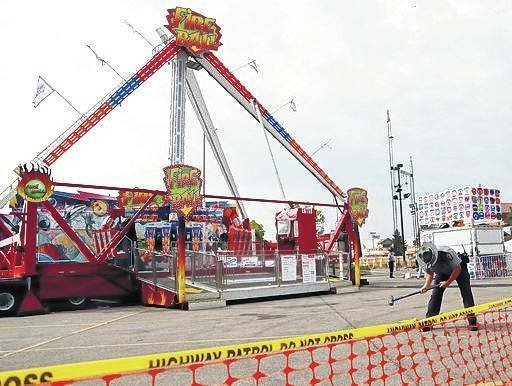 The state’s own ride inspectors do visual checks of the fair rides to make sure they’re assembled and operating properly, said Mark Bruce, a spokesman for the Ohio Department of Agriculture. Usually it’s cracking and faulty welds that cause metal fatigue on amusement rides — not corrosion and rust. Corrosion was to blame, though, when a steel piece broke off a swinging ship ride in 2011 and struck a teenager at Morey’s Piers in Wildwood, New Jersey. A veteran ride inspector and accident investigator in Nevada said that with almost every failure there’s an indicator such as cracks or rust. Among the big questions with the Fire Ball accident, said Greg Fehr, of Advanced Technology & Marketing Group in Henderson, Nevada, is why the corrosion wasn’t spotted.